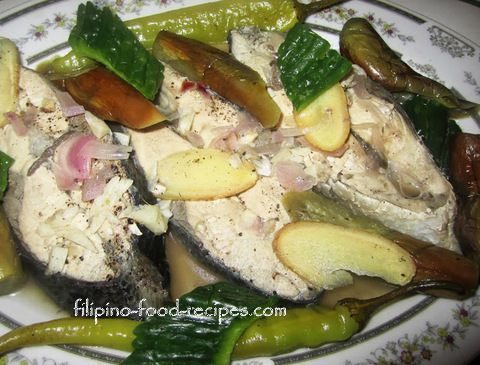 Paksiw na Isda is a dish where fish is poached in vinegar and ginger. Fish is merely cleaned, innards and all removed but with scales intact. According to the book Philippine Cookery and Household Hints by Herminia Villacorta-Alvarez, the word pak siw "is a native term for pickling fish and meat. Fish or meat is cooked with vinegar, salt, garlic, and a little water; with or without ginger and sugar." It says, "Most common fishes cooked as paksiao are: Bangus (Milkfish), Biya (Gobies), Talilong (Black Finned Mullets), Banak (Long-Finned Mullet), Buwan-buwan, Bidbid (Ten Pounder) and Kitang(Spadefish)." My mom's recipe for this dish uses long chili peppers for added zing, and she removes the fish scales before cooking it. On the other hand, my brother's recipe adds ampalaya and eggplant, which are completely optional. 1 Put all the ingredients, except the eggplant and ampalaya, in a pan and bring to a boil. Do not stir. 2 Add the eggplant and turn the heat down and simmer for 10-12 minutes or until the fish and eggplant are done. Turning the fish over to the other side is necessary if the pan you are using is too wide and the fish is not totally immersed in the liquid. 4 Serve with a plate of rice. You can use Galunggong instead of Bangus. 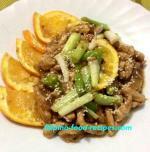 Try to watch the cooking time as it is not as meaty as the Bangus, thus, tends to cook faster. Do not stir the vinegar mixture in Step #1 so the vinegar will not taste fresh and very tangy. Ampalaya and Eggplant are optional, if you would rather just have the fish, just omit the vegetables. Handle the fish delicately so it doesn't fall apart when you are flipping it over or when plating the dish.